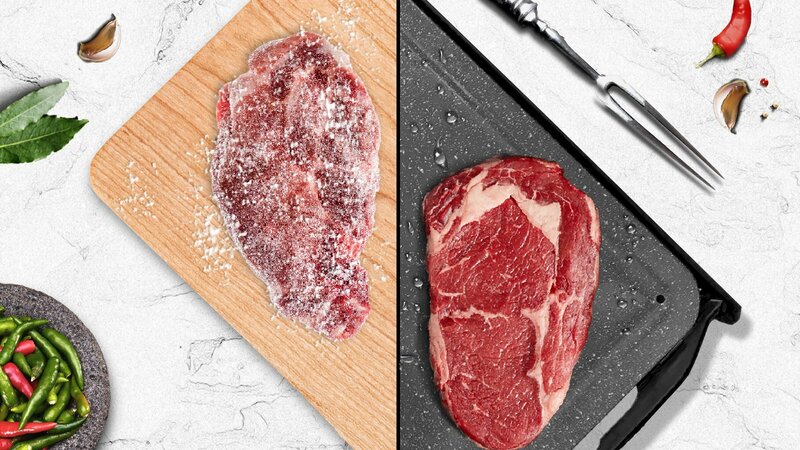 Defrosting meat is one of the biggest obstacles I have when it comes to home cooking, so when I came across the Yeti Touch Defrosting Tray I knew it would have life-changing possibilities. Yes, sometimes we have to freeze our meats or even sometimes vegetables or fruit at home. I don’t really plan dinner in advance, so if something needs to be defrosted I usually take it out 20 minutes before I’m going to start cooking. In turn I find myself struggling to defrost food in the microwave and I absolutely hate it. Yeti Touch defrosting tray will defrost rock-hard meats, poultry, and fish in as little as 20 minutes and this my friends can change lives. Sure there are other defrosting trays on the market, but Yeti Touch takes design into consideration by making sure there’s no messy overflow to clean up after defrost. All the water is carefully run off and trapped in a safe, water secure tray underneath the defrosting tray. They’ve also looked carefully at the material which consists of Aero-aluminum with enamel coating, and is food grade material meeting the FDA standard. It can also double as a cutting board or a regular serving tray. You can back the Yeti Touch defrosting tray on Kickstarter and as of right now it has blown past it’s goal, so you should see it going into production soon.